Cao Dai is a new region founded on 25 Dec 1925 in Tay Ninh, a city near HCMC. Remember our one day tour was screwed when we were in HCMC? We miss the visit to the HQ of Cao Dai temple in Tay Ninh as a result, and ended up only to Cu Chi tunnels. When we arrived in Danang, we noticed that the biggest Cao Dai temple outside of Tay Ninh is here, so we must not miss it this time. Again, we did not do any research before going, all the information I have here is collected afterwards. The outlook of the temple is a bit of a crossover of oriental and western architecture, but nothing too special about it. But I was a little bit shocked when I got inside the temple. 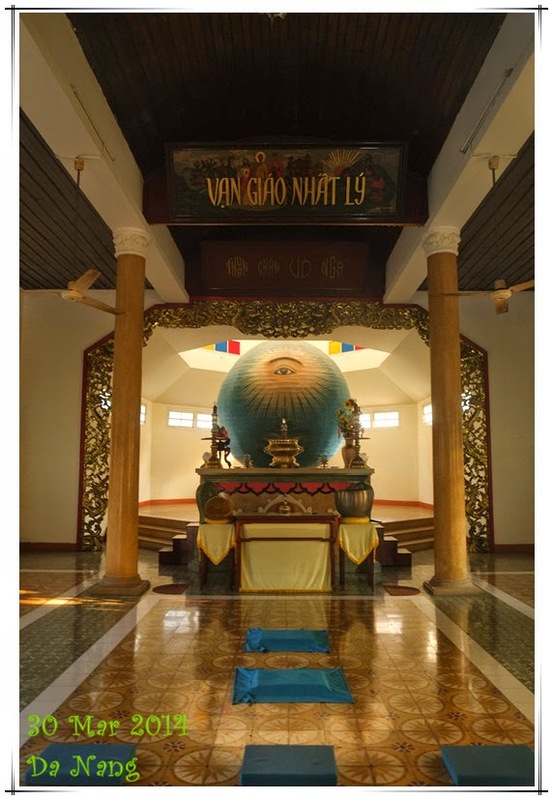 There is a huge blue sphere behind altar with a big eye on the sphere. Honestly, I find this a bit scary and also made me think about the Japanese comics “20th century boys”. According to Wiki, this is the symbol of Cao Dai, the left eye of God. We know that there will be prayer time (everyday, prayer time at 0000, 0600, 1200, 1800), so we waited. 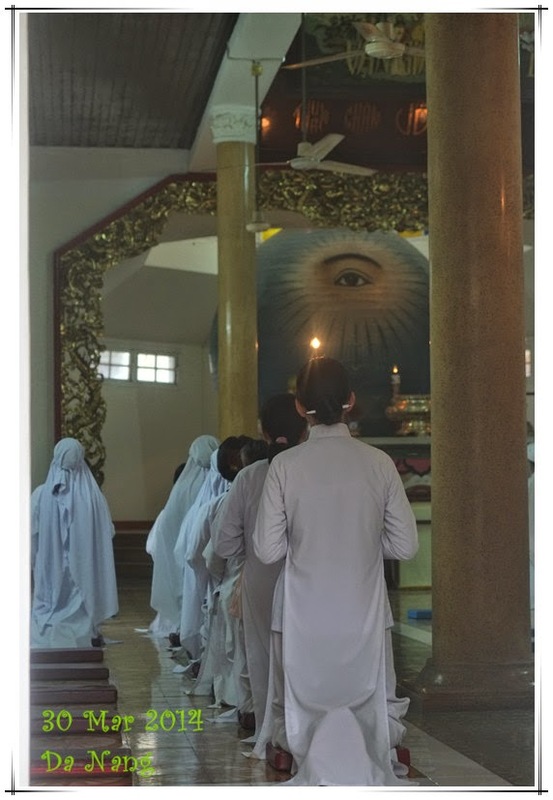 The followers wear white robes and enter the temple bare footed. They are praying, standing and kneeling down. 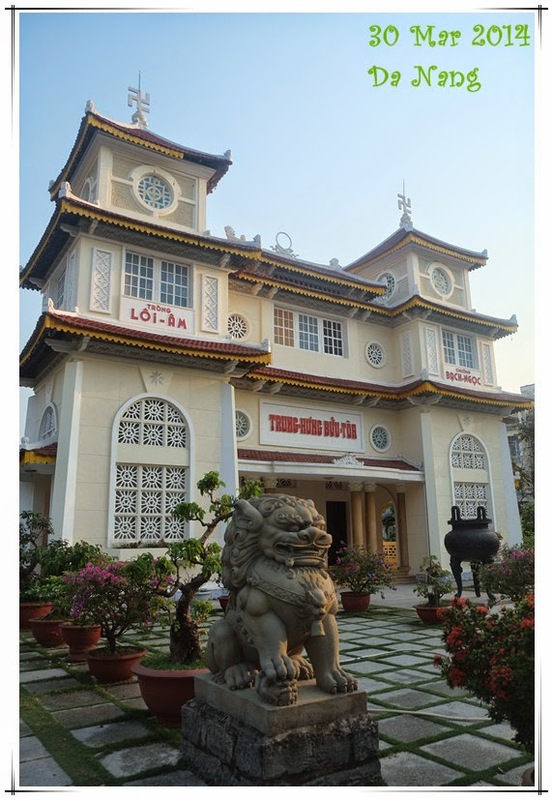 I don’t think I can understand everything about Cao Dai, if you find it interesting, learn more from Google. Champa is the people who settled in Central Vietnam and Cambodia many years ago. Their religion is very similar to the Hindu religion we saw in Cambodia last year. There is a tourist spot “My Son” near Hoi An which has a few Hindu temples but we have skipped this since we already seen the Angkor Wat last year. In Danang as well, we went to visit the Cham museum, which is not too informative but we noticed something interesting and different from what we saw in Cambodia. We see most of the familiar Hindu gods but their appearance are slightly different. Looks more rounded and cute in the Champa world. 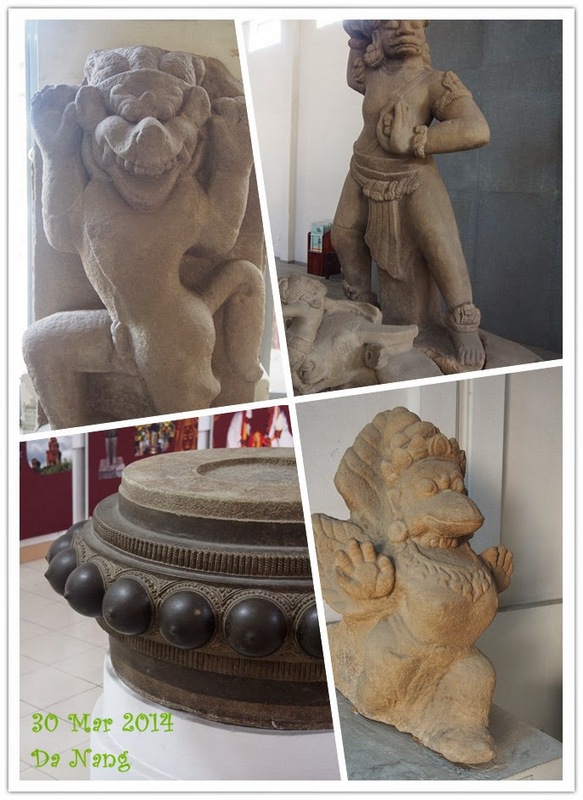 In addition, with Hindu in Cambodia, you see a lot of Linga (man’s sexual representation), while in the Champa world, they created female version of some of the Hindu gods and in particular, they uses the women’s breast to represent the female god. This is not something that exists in Hindu in Cambodia.